you can click and drag to see differentlocations on the map. You can put the curser over a city on the map and you get the description of it. to get to the location and how farthere is, as you can see on this picture in top right corner. For full map with all cities and coordination click her. 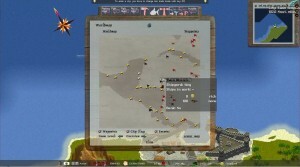 At the bottom of the map you have options to have Waypoints, City flags and Enemies on or off. where you have not discovered yet the map will be black. as if you are at the edge of map you cannot be totally in center.